In celebration of Earth Month, Arizona PBS has announced a slate of all-new episodes, games and activities to encourage kids and families to get outside and enjoy nature. 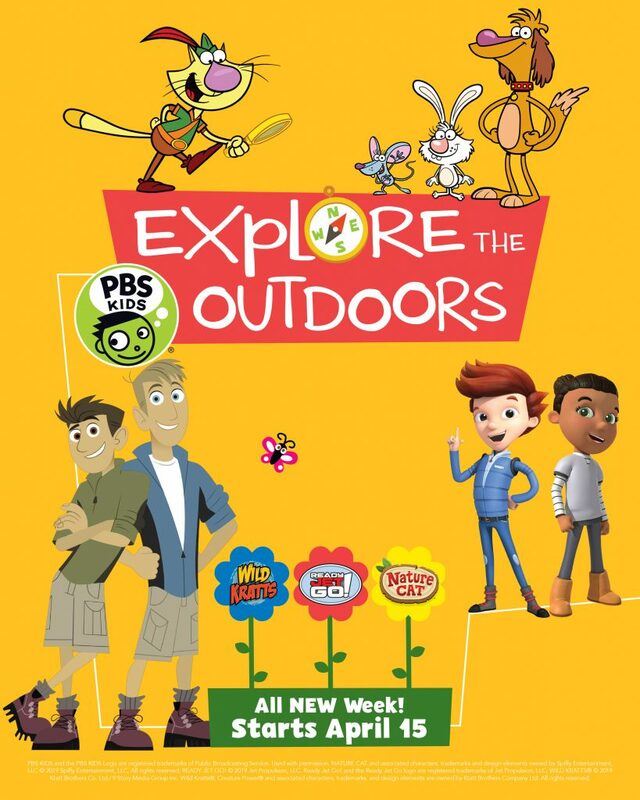 Beginning April 15, viewers will be able to enjoy a special week of adventures from WILD KRATTS, NATURE CAT and READY JET GO! The new episodes will debut on Arizona PBS, the Arizona PBS KIDS 24/7 channel and PBS KIDS digital platforms. Premieres and streams Monday, April 15, at 7 a.m.
“Who Messed Up the Treehouse?” – Each kid brings their personal project up to the tree house, and each contributes to a huge mess. Now they can’t do anything in the tree house because it’s too messy, but none of them want to clean up the other’s mess. They have to learn to share the responsibility and clean it together. “Fact or Fiction?” – When Mindy tells Jet that clouds are made of cotton candy, and defends this idea because she heard a friend say so, Sean and Sydney set out to show her how to separate fact from fiction through research! Celery takes them up into the clouds to see for themselves. Premieres and streams Tuesday, April 16, at 7 a.m.
“Moon Circus” – Carrot is about to turn 250 Bortronian years old, and the kids have set up a backyard circus to help him celebrate. They all notice that Earth’s gravity makes it hard to perform their circus stunts, so they take the whole circus to the Moon, where its 1/6th gravity makes all their stunts much easier! “Every Day Is Earth Day” – It’s Earth Day, and the kids are preparing posters for the big community celebration at the DSA. 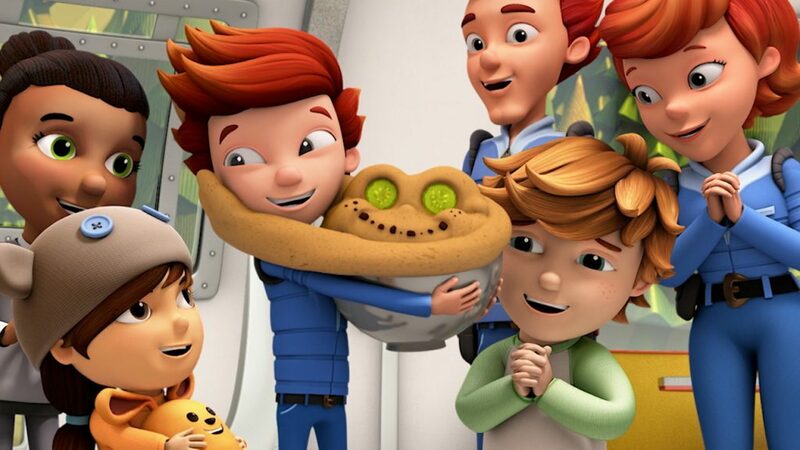 They decide to research their posters by traveling all around the Earth in Jet’s family saucer and observing all the things that make Earth so special. Premieres and streams Wednesday, April 17, at 7 a.m.
“My Three Suns” – The kids can’t play shadow tag because the Sun keeps going behind clouds. Mindy wants the sun to be out all the time! Face 9000 tells them about a system with not one, but three suns! That sounds like a place where there would be shadows all the time. Celery takes them to visit in the family saucer. “Magnet P.I.” – Sean becomes an amateur magician called the Great Seanzo, dazzling the other kids with magnet tricks. Jet becomes fascinated by magnets, and they all explore the various things magnets can do, culminating in a magic magnet show for Carrot. Premieres and streams Thursday, April 18 at 7 a.m.
“Sunspot’s Sunspot” – Sunspot begins acting strangely, and Jet fears that he is sick. Carrot and Celery examine him, and decide that he’s acting strange because of a large sunspot on the Sun. The only way to cure him is to bring him to the Sun and get him close to the huge sunspot. “Our Sun Is a Star!” – Mindy wants to have a sleepover outside with her friend Lillian, but it’s winter and too cold to sleep outside under the stars. Sean points out that they are under the light of a star all the time – our Sun! Mindy learns that our Sun is a star, just like the tiny ones we see at night. Premieres and streams Monday, April 15, at 8 a.m. and 3 p.m.
“Wild Batts” – In this fun PBS crossover episode Chris and Martin Kratt show up on Nature Cat as Chris and Martin Batt, two wild bat brothers whose tree home is destroyed, forcing them to find a new shelter. Enter Nature Cat and his pals who come to the rescue, helping Chris and Martin Batt by building them their brand new home! Onward and keep-on-nature-adventuring-ward! “No Bird Left Behind” – A Baltimore Oriole named Brooks hurts his wing and cannot fly south for the winter. This is not good because in the winter, Brooks’ food source of bugs and berries are very scarce. He needs to get south! Enter Nature Cat and his pals, who are up for the challenge of helping Brooks migrate south, but how are they going to fly him there? Oh Houston, we have a problem! Premieres and streams Tuesday, April 16, at 8 a.m. and 3 p.m.
“Soil Turmoil” – Look out world, Steve the Vole is not a happy camper! And he has every right to be upset because his burrow is gone. It was the perfect place to live. The dirt was soft enough to dig though and firm enough to hold his tunnels, but now it’s just a giant hole in the ground! Who would take all that dirt, and why? Steve just wants his home back – is that so much for a little vole to ask for? Not to worry! Nature Cat, dirt retriever extraordinaire, is on the case. Onward and dirtward! “Wisteria Hysteria” – Oh no! Daisy needs some big-time help today. She was on her way to bring jumbo carrot muffins (made with true love) to Granny Bunny, but when she came to the tunnel of wisteria vines she usually goes through to get to Granny’s house, someone started throwing things at her so she got scared and turned around. That’s just not right! Who would do that? Hal hears that Big Bad Wolf was in that area, and since he is so big and bad, he’s probably the one throwing things. The Big Bad Wolf? Gulp! The gang investigates only to find that the culprit is…an exploding wisteria seedpod? Premieres and streams Wednesday, April 17, at 8 a.m. and 3 p.m.
“Nature Cat’s Nature Stories” – It’s Nature Stories day today and as his friends gather around, Nature Cat tells his made-up silly story of where the wind comes from. And who would’ve guessed that according to Nature Cat, wind comes from the elephants in the west who use their huge trunks to blow cool air across the land! Funny! Squeeks and Hal get into the silly storytelling spirit with their tale of how the firefly got its light – it’s because the sun gave them light on their tails so they can have parties at night and see what they are doing. Really wacky! Now it’s Daisy’s turn to tell a silly story, but she is having a little trouble coming up with an idea! “Pattern Problema” – It’s a race against the clock for Hal! He was doing a little dog house redecorating to surprise his mommy when she comes over later in the day, but there is something wrong with Hal’s wall decorations. It looks like a few wallpaper patterns put here and there, and not very pleasing to the eye. Hal needs to finish before his mommy gets there, but he doesn’t know what to do to make his doghouse look beautiful! Nature Cat gets an idea – how about getting out into nature to get inspired by nature’s beauty? Premieres and streams Thursday, April 18, at 8 a.m. and 3 p.m.
“Animal Rescue Crew” – When Nature Cat and his pals spend the day playing Wild Animal Rescue, they come across a little baby fox with a cut on its front paw. Oh no! The little baby fox is injured and needs help. Looks like it is time to call the greatest animal rescuer in the whole wide world, Racer the Rescue Raccoon. Good golly, hello dolly! “Nature of Dreams” – What a bummer! Sadie hurt her paw and now she has to wear a cone and sit in her apartment for a whole month while it heals. Doctor’s orders! Now, Sadie can’t go to the nature playground across the street and watch all of her favorite bugs and birds. The gang feels so badly for her, and Hal wishes there was a way to bring nature to her while she’s healing. That’s it! Hal’s a genius. Maybe there is a way to bring the bugs and birds to Sadie’s balcony. Onward and cityward! 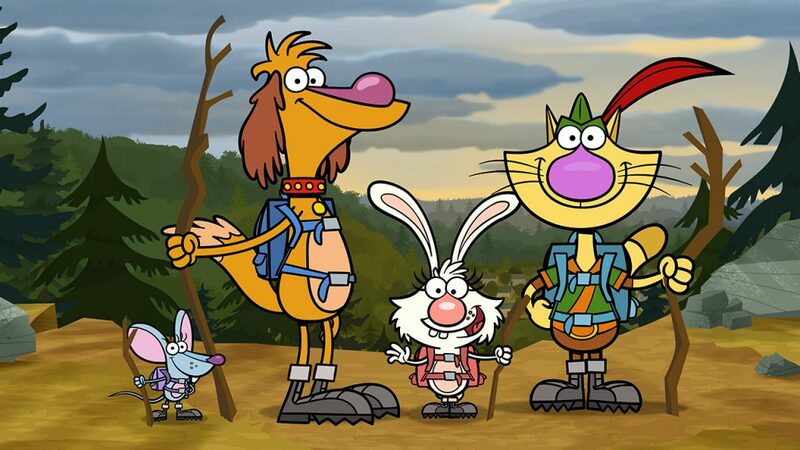 Premieres and streams Friday, April 19, at 8 a.m. and 3 p.m.
“Freezin’ in the Summer Season” – Get ready, gang, it’s time for Nature Cat’s annual Summer Fest – summer fun, the whole day long. Whoo hooo! First up is their Summer Fest Sprinkler Frolic, followed by Summer Fest Bike Ride and Summer Fest Kickball game. Nothing can ruin their wonderful Summer Fest, except for the super tall dark clouds approaching and the ominous cool breeze. Man oh man! A thunderstorm! But wait a tick, what is that stuff falling from the sky? It looks like snow, but it’s bouncy. Snow in the summertime? Gimme some whaaaaat? “Total Eclipse of the Sun” – No one has ever seen Houston as excited as he is today. Know why? Because today there will be a total eclipse of the sun. Woo hoo! Raise the roof! Get this, the sun will be totally blocked out by the moon, so you won’t be able to see it, and it will get dark in the middle of the day. The rest of the gang cannot wait to see the eclipse with Houston, except for Hal, who runs away to hide because he is scared. Hal? Premieres and streams Monday, April 15, at 7:30 a.m. and 3:30 p.m. When Aviva makes a Flamingo Creature Power Suit, the color doesn’t work. The suits are completely white, and the gang can’t figure out why. All of the DNA is correct. There’s nothing wrong. So where does the flamingo’s pink come from? The gang is on a quest to solve the Mystery of the Flamingo’s Pink. 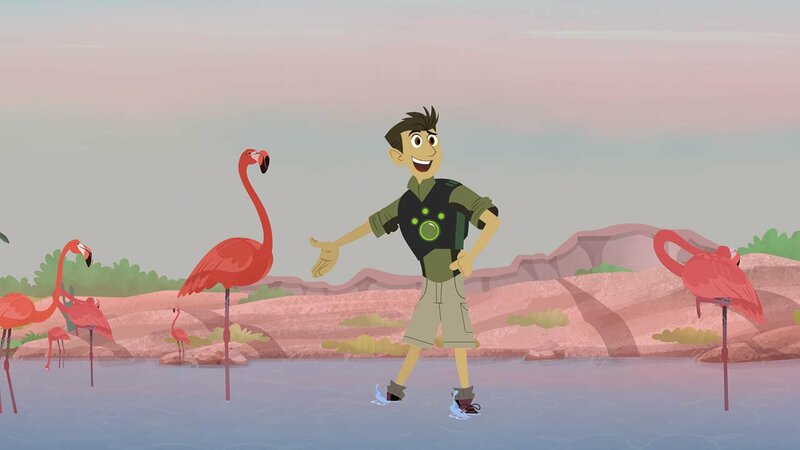 Premieres and streams Tuesday, April 16, at 7:30 a.m. and 3:30 p.m.
Chris is in the middle of organizing his creature power discs when they get a call from Wild Kratts kid Manuel, who lives in the Sonoran Desert. He says he has spotted an ocelot in his backyard. An ocelot in the desert? That’s so rare, since these wild cats usually live in rain forests. Their Creature Mission is on: to “spot” an ocelot in the desert. 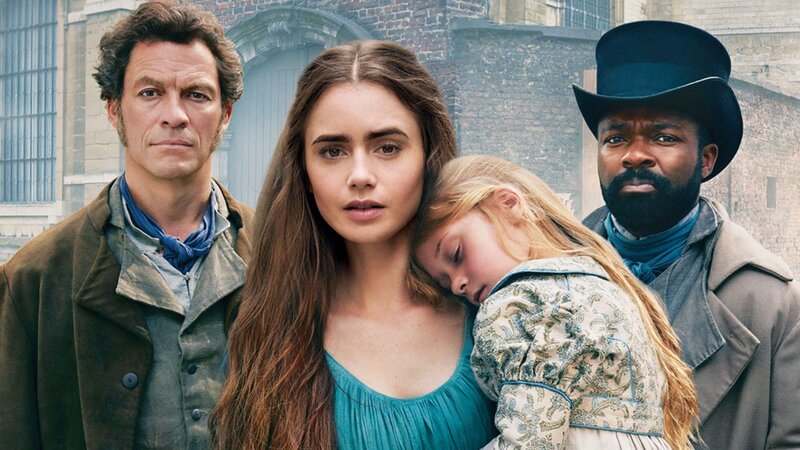 Premieres and streams Wednesday, April 17, at 7:30 a.m. and 3:30 p.m. 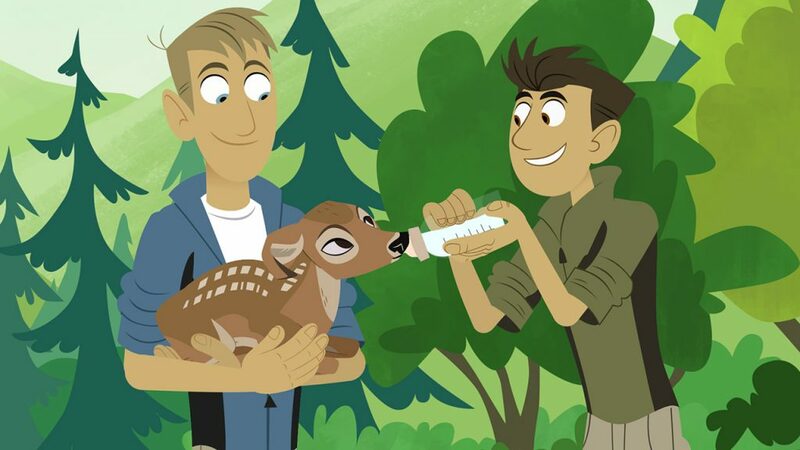 The Wild Kratts team searches for a fawn – Buckaroo – they helped a few years ago to find out how he’s doing now. In the process, they learn about deer society and the vital purpose of antlers.